Between 13 and 15 February, 1945 the RAF and the USAAF bombed the German city of Dresden dropping almost 4,000 tons of bombs. A firestorm was generated, with temperatures raising beyond 1,500° C and strongest winds sucking people and things in the fire. 90% of the city center was destroyed, including the Frauenkirche, rebuilt only in 2005. In front of the church, three busses are parked in quite an odd way. Part of UK history that I'm not proud of but hard times command hard solutions I guess. The square is so beautiful once again... apart from this odd monument. @vignouse Thank you Richard, I think that war is war, that I t's awful and has no rules that can't be broken. There's nothing to be proud in the history of a war... I was just amazed about how much this beautiful city is carrying on the scars of that episode. @kali66 don't believe the firestorm was planned: it just happened. As to the busses: I believe they were planned, and they are really odd! Insane juxtaposition Domenico. I doubt there is a compositional contrast like this anywhere else in the world. Dramatic sky by the way. @chillen I agree, Chillen, insane! You wouldn't think the church was only rebuilt in 2005, it's looks so old. Odd art indeed. @overalvandaan they used every piece of debris left after the bombing. They rested on the square until the fall of the Berlin Wall and the unification of Germany. Strange indeed. Such an odd sight but interesting. 90% destruction is phenomenal. We live in a crazy world. Fascinating and hard to understand that sculpture. Your composition shows the oddity so well. 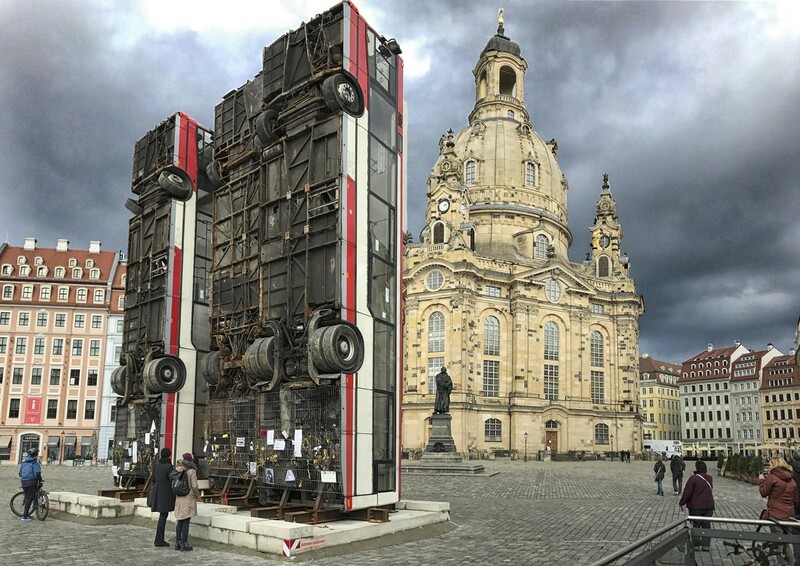 Clearly the buses did not come from a Lancaster ... quite the juxtaposition, though. Ah Dresden... I didn't realize the rebuilding of the center was so new! A sobering history, for sure... a beautiful shot of very contrasting monuments, Domenico. Whoa, those buses are standing up?! Amazing. I can't stop looking at this for some reason. @cjphoto Yes they do. Quite amazing, I agree. @blueberry1222 Thank you, Krista, it is so weird, effectively! The story of the Dresden firestorm always makes me sad ... just that, sad. I know it wasn't intentional, but the thought of not just the burn victims, but also all the people suffocated in the bomb shelters because all oxygen was consumed by the fire. @runner365 Yes, it is something unbelievable. And you're right. It makes one sad.